Architects and designers today have a wider choice in flooring than at any other time in history. One of the newest innovations in flooring is the use of metal. Recent technological advances have brought aluminum and stainless- steel flooring products to market with great success. A range of rich colors and stunning metals allows today’s imaginations to create freely—from subtle and sophisticated to bold and brash statements. Various installation options allow temporary or permanent systems. And of course, nothing else can match the performance characteristics of real commercial grade metals used as flooring. A new innovative product in metal flooring is XFloor, manufactured by Pittsburgh-based diamondLife. It is a unique interlocking tile system that simply snaps into place. No glues, no toxic fumes, no mess. Commercial-grade metals such as stainless-steel and aluminum diamond plate are fl ame-laminated in a proprietary process to a copolymer base, creating a 1/2-inch- (13-mm-) thick tile that can hold up to 25 tons (23 metric tons), evenly distributed. Each 12- by 12-inch (305- by 305-mm) tile has 28 locking points, in a loop-and-hook configuration, that allow tiles to interlock. Sloped border tiles create a finished edging. XFloor can lie over any base flooring and stays in place under its own weight. Cleaning is easy, by mopping, hosing or even power washing. Tilefit is tight, but should moisture pass through any gaps, built-in channels on the bottom of the tiles allow liquids to flow away or evaporate. 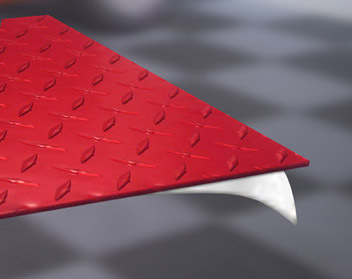 Although XFloor works best on relatively flat base floors, there are slight hinges between tiles, allowing some variations in base floor flatness. Any large variations should be removed. There is no need to clean or prep the base floor. XFloor lies on top of just about any substrate, including grass. Among XFloor’s stunning characteristics is the range of rich, anodized colors. Patterns and shapes can be created with ease—and as easily as the floor snaps into place, so too can it be snapped out. 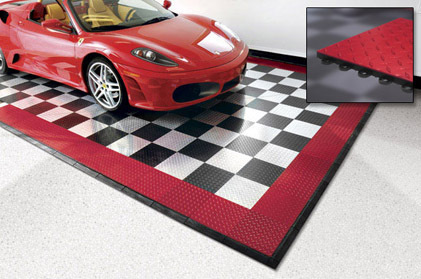 The interlocking feature allows the floor to be changed as often as you change your mind—and of course, the floor is totally portable so you never have to leave it behind. Another revolutionary metal flooring product from diamondLife is MaxTile, a self-adhering metal floor or wall tile in your choice of commercial- grade stainless steel or aluminum. With a built-in adhesive that permanently bonds to any indoor surface, you need only remove the liner and put the tile in place—again, without glues, toxic fumes or mess. The applications are endless, from small spaces to large galleys, for protection and beautification. Each tile is approximately 1/16-inch (1.6-mm) thick and comes in numerous sizes, ranging from 12- by 12-inch to 48- by 96-inch (1,219- by 2,438-mm). A variety of anodized colors offers multiple design options. The base floor should be clean and dry before installation. Concrete base floors work best, but other floor types are possible. Like XFloor, cleaning MaxTile is a simple matter of running a mop, a hose or a power washer over it. Tiles are installed flush against one another, so gaps between them are nonexistent. A flat base floor is not even required. Individual tiles can be cut with standard jig, circular or band saws using a sheet-metal blade. Durability is also a standard benefit as metal is tougher than ceramic, porcelain, marble, granite, wood, carpet and other traditional flooring surfaces. Finally, MaxTile also can be used on walls to create breathtaking wainscoting. The company announced recently that it will introduce another MaxTile family member: a tile that looks exactly the same but that installs via traditional trowel methods using thinset. If your next project involves flooring, consider using metal. It has come a long way since the days of gluing big metal sheets to the floor, now offering a variety of commercial-grade metals and rich color options. Anil Gupta is a brand manager at Pittsburgh based diamondLife. For more information, visit www.diamondlifegear.com.